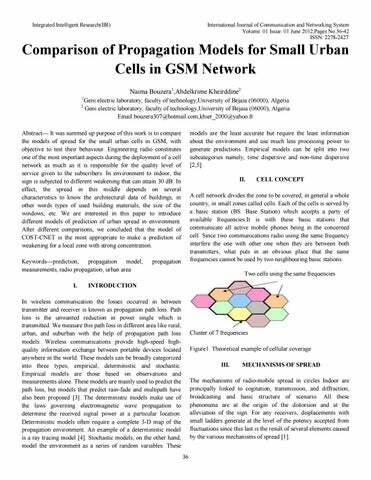 Abstractâ&#x20AC;&#x201D; It was summed up purpose of this work is to compare the models of spread for the small urban cells in GSM, with objective to test their behaviour. Engineering radio constitutes one of the most important aspects during the deployment of a cell network as much as it is responsible for the quality level of service given to the subscribers. In environment to indoor, the sign is subjected to different weakening that can attain 30 dB. In effect, the spread in this middle depends on several characteristics to know the architectural data of buildings, in other words types of used building materials, the size of the windows, etc. We are interested in this paper to introduce different models of prediction of urban spread in environment. After different comparisons, we concluded that the model of COST-CNET is the most appropriate to make a prediction of weakening for a local zone with strong concentration. Keywordsâ&#x20AC;&#x201D;prediction, propagation model, measurements, radio propagation, urban area I.
models are the least accurate but require the least information about the environment and use much less processing power to generate predictions. Empirical models can be split into two subcategories namely, time dispersive and non-time dispersive [2,5]. II. A cell network divides the zone to be covered, in general a whole country, in small zones called cells. Each of the cells is served by a basic station (BS: Base Station) which accepts a party of available frequencies.It is with these basic stations that communicate all active mobile phones being in the concerned cell. Since two communications radio using the same frequency interfere the one with other one when they are between both transmitters, what puts in an obvious place that the same frequencies cannot be used by two neighbouring basic stations. Cluster of 7 frequencies Figure1. Theoretical example of cellular coverage III. SPREAD RADIO Engineering radio constitutes one of the most important aspects of the deployment of a cell network in quality of service given to the subscribers.In urban environment, the sign is subjected to different weakening. In effect, the spread in this middle depends on several characteristics: the height of LOW VOLTAGES (foundation transmitter station), their sites, the height of buildings, the breadth of streets etc. The radioelectrical wave is subjected of it made to numerous distortions caused by physical obstacles (building, transports, tree). In the field of radiocommunications, there are several models of spreads which can be used for the dimensionnement of the radioelectrical coverage. We are interested in this chapter to introduce different models of prediction of spread in urban environment; where we shall itemize the model of course more. Comprehension and installation of a mobile network such as GSM network require a definite characterization of the radio-mobile channel, In effect, the modelling of the channel radio can be assured by mathematical models which allow to predict the variation of the level of accepted sign. These models are also used to help us to determine the optimum positions of antennae and in the analysis of the quality of service. So, we can differentiate three big families:The empirical models (called still model statistical) which are based on analyses statistics a big number of experimental measurements and that take into account different parameters such as the height of buildings, basic stations, the terminal while taking into consideration various influence of environment. -The determinist models which are based on the fundamental laws of physics, and call complex mathematical relations which (II.1) are difficult to use. Withf:thefrequencyexpressedinMhz d: distance between the transmitter and the receiver, expressedinKm. The principle of the models of spread is to calculate alleviation in free space and add it a corrective factor. We are interested in what follows in different models of spread but we limit ourselves to those of circles indoor as much as our interest aims at environments inside. Where: D:distanceinKm. f: frequency in MHz. d: distance between buildings in (m). hb: the medium height of buildings in (m). hsb: the height of the basic station. hm: height of the motive in (m). This model is applicable to urban areas and suburban. It assumes that the antenna heights of base stations are quite high and surrounded by rows of buildings of similar height and regularlyspaced apart by a distance d. In other words, it assumes that streets are perpendicular to the incident rays. With: φ: orientation of the street in comparison with the incidental ray (in degree) hb: medium height of buildings. L: the coefficient of cogitation of buildings is. Ikegami assumes that buildings introduce weakening of 6dB. X.
Aff = Aff0 +Aff1 With: Aff0: is the attenuation in free space given by relation Aff0 = 32.4 + 20 log (f) + 20 log (D) Aff1: correction term which takes into account the curvature of the earth and the urban environment. Aff  Aff0  Aff msd  Aff rts  Aff deg 1.
w : the breadth of the street f : frequency φ : the orientation of the street from the radius. With : h : the height of clearing of the ellipsoid of Fresnel r : the ray of the ellipsoid of Fresnel..
such as the orientation of streets, the height of buildings and spacing out between buildings. 1. Influence of the orientation of streets For this first comparison interest us to us to the first mailman who is the orientation of streets in comparison with the incidental wave coming from the basic station. Three models take into account this mailman to know COST-CNET, SAKAGAM and IKEGAMI. 2. Influence of distance between buildings The second mailman to be taken into account is distance between buildings. It is considered in two models, that of BERTONI-WALFISH and COST-CNET. Figure6. Influence orientation of the street in the model COSTCNET. 3. Influence of the height of roofs The third mailman in considered is the height of buildings, It is introduced into two models which are: COST-CNET and IKEGAMI. models studied in this job, It characterizes at best the environment of spread. REFERENCES  R.Charle House, Electronique appliquée : les antennes fondamentaux, 3éme édition, Dunod, Paris, 2006. H.R.Anderson,Fixed Broadband Wireless System Design.John Wiley & co.2003  R.K.Crane ˝Prediction of attenuation by rain,˝ IEEE Transactions on communications,vol.COM-28,pp.1727-1732,seotember 1980 .E.Athanasiadou,A.R.Nix,and, L.P.MeGeehan,˝A Microcellular raytracing propagation model and evaluation of its narrowband and wideband predictions,˝ IEEE journal on selected areas in comm..,wireless comm., series,vol.18 pp.322355,march 2000  Purnima K Sharma, R.K.Singh, “Comparative Analysis of Propagation Path Loss Models With Field Measured Data” IJEST, Vol.2(6)in 2010 at 2008-2013. M. Hata, “Empirical formula for propagation loss in land mobile radio services,” IEEE Trans. Vehic. Technol., Vol VT-29, No. 3, pp. 317–325, Aug. 1980. COST Action 231, “Digital mobile radio towards future generation systems, final report,” tech. rep., European Communities, EUR18957, 1999.